She was notoriously the scariest member of the Spice Girls and, as a mature Spice Woman, she is still causing absolute chaos. Melanie Janine Brown aka Mel B aka Scary Spice is a modern icon of girl power, instilling a love of (faux) leopard skin prints and daring tongue piercings in a generation of girls. Loud, strong willed and a formidable judge on various telly talent shows; she isn’t one to take on unless you are feeling particularly brave. Mel posted a glam piccy of her wearing a two piece bikini and a pair of sky-high red heels which showed off her super toned figure. Here, the lass from Leeds poses before a gloriously Spice-ish background of iconic animal print and platform trainers; taking everyone straight back to the 90s as if aboard some magical time-travelling bubble chair. However, the focus was not on Mel’s enviable gym-bod or even the heady dose of nostalgia overload. Fans were far too distracted by the colour of the Spice Girl’s skin, which they felt appeared much lighter than usual. Bleached up your skin, and disrespected the very melanin thats making you look so young. Sad foolishness. Wtf – have you really bleached your skin? Why would you do that when you have mixed children? Think about how it feels to be in her shoes maybe. I know Mel isn’t insecure but every woman gets that way sometimes. She posts a photo feeling good in her bikini and it looks smoking hot. She gets on her phone and there are tons of comments that are picking on her because her skin looks lighter. Yes there are ones that say how good she looks and more of those than bad. 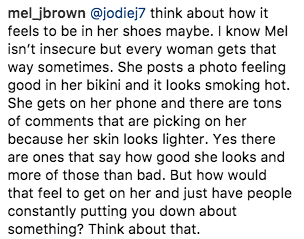 But how would that feel to get on her and just have people constantly putting you down about something? Think about that. Fair enough. It hasn’t exactly been the sunniest recently. On other matters, I’m sure other twenty-somethings who spent their childhoods deciding which Spice Girl they would be just internally shrieked at the site of this dreamy Spice Shrine. Will we ever get another reunion tour of these five absolute gems? !